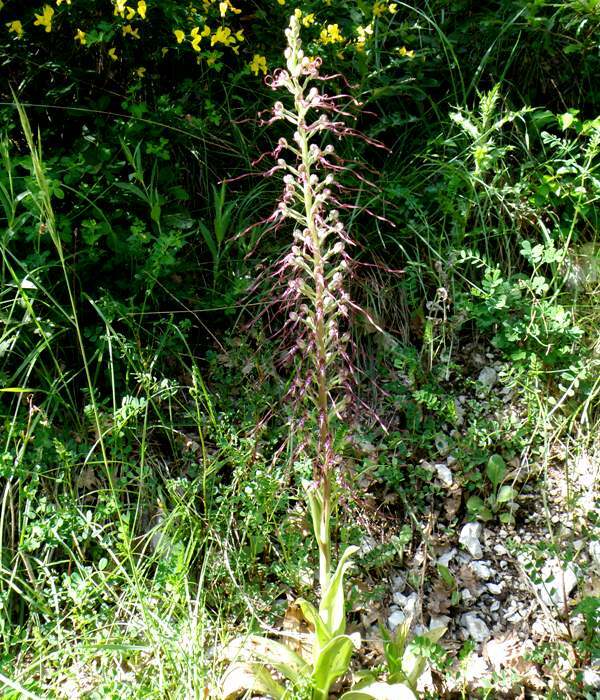 This orchid is rare in the UK but more easily found in parts of France and other European countries. It grows up to a metre in height but can nonentheless be difficult to spot if it is growing, as it often does, in long grass on roadside verges which seem to be a favourite location. 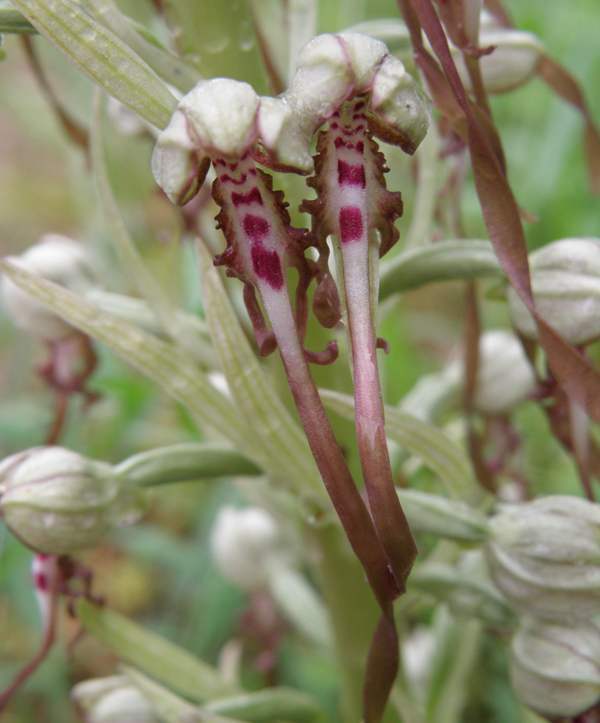 The Lizard Orchid is pollinated by insects and, in particular, bees. The long, tail-like lip is often spiralled and dotted with pink or purple in the centre. The flowers have a rather foul smell which is said to be similar to the smell of goats. Now rare in the UK and only appearing there in large numbers on the golf links at Sandwich in Kent and a few nearby gardens, it is widespread but rare and localised in parts of Southern and Central Europe. One of the best places to see this impressive orchid is the Lot Valley in France where the Lizard Orchid occurs in large colonies along the sides of the roads. We have also seen this orchid (or possibly the closely related Himantoglossum caprinum) in Bulgaria where it is rare and localised. 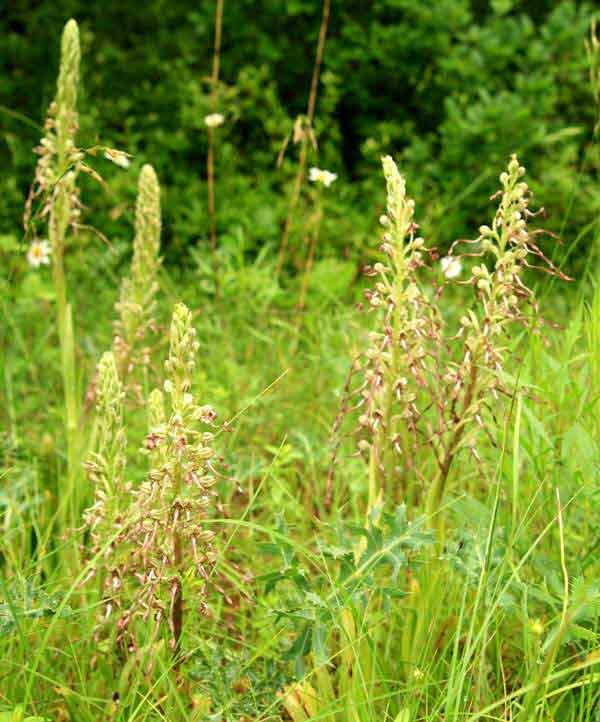 A lovely colony of Lizard Orchids found on the roadside in the Lot Valley in France. In southern France this orchid starts flowering from late April, but further east in Europe it can still be found in full flower in July. The specimens on this page were photographed in the Lot Valley, France in late May where they occur in vast numbers on the roadsides and in the meadows.